From the 1953 Glamor Girls - No, 2001C. Somewhere along the way, this doll obtained the nickname of "Picnic Day". An usually striking doll, with green leaves on strawberry pink and a wide green sash. Black val lace is used to trim the gown. The Glamor Girls series of 1953 included seven dolls. It was a remarkable year for Madame Alexander which also included the six Beaux Arts Creations based on the Royal Recessional of 36 dolls created for and commissioned by department store Abraham & Straus to celebrate Queen Elizabeths II Coronation. 1953 was the introduction of the 7 1/2" Quiz-Kin and Wendy Ann dolls. 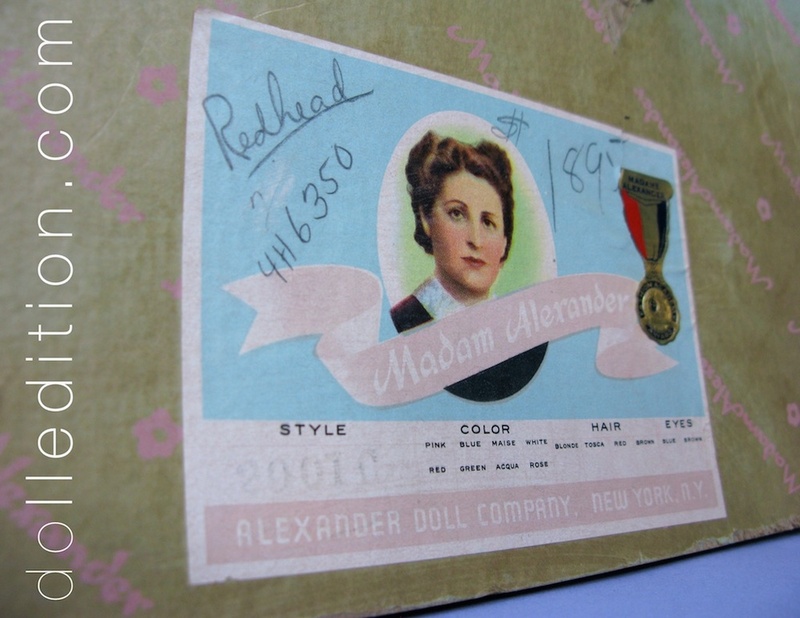 It was also the Alexander Doll Companies third consecutive year to receive the Fashion Academy Gold Metal - So things were moving on all cylinders for Madame Alexander. The box of this doll is marked $18.95. An old store advertisement shows the Queen of the Beaux Arts Creations series at $34.95, and the other Beaux Art dolls at $24.95. All the dolls are walkers. Perhaps the Glamor Girls were at a slightly lower price point to attract a wider range of costumer. The dolls of the Glamor Girls series are 18" tall. The dolls are also walking dolls. This was a very important new feature at the time. The large straw hat is trimmed with roses and black millenary veiling. The dolls box shows the original $18.95 price of this stunning doll. This Glamor Girls "Picnic Day" is featured in my new article for THE REVIEW magazine of the Madame Alexander Doll Club.